Little Bits Of Good – enough. Little Bits Of Good – enough. January. A time to take stock in what’s working and what’s not. Resolving to do better this year. Worrying that nothing will change-again. Losing those 30 pounds… for real this time. Giving up all foods that contain white sugar and flour. Quitting smoking. Quitting drinking. Quitting gambling. Quitting failing. January in the western world is full of anticipation and anxiety as we look for a fresh start – as we look for something that will keep us moving into the life that we want. How might we take the start of another calendar year to surrender into a version of life that is simply… enough? What it would be like to be satisfied – really satisfied – with exactly where we are, regardless of what our external life situation might look like? How can we use our everyday actions to illustrate a way of being in the world that promotes joy instead of suffering? How can we make January about what is, instead of what isn’t? I wonder how to accept the present – to really, truly accept it and be in it. I wonder how to discern the direction my life needs to take to best serve my family and the larger collective. I wonder how to be in the world as one of the privileged, and how to accept that for what it is. I wonder how best to use the abundance that I have to help others see their own. I wonder how to use ideas that don’t work as stepping stones toward those that do. I wonder how to be in the world in a way that speaks truth. I don’t know the answers to most of these questions. I do know that asking them is important, and that the answers will likely not be what I think they should be. Doing things differently isn’t easy, or fun, or comfortable. But doing things differently is exactly what it will take to see peace in the world. I know that I want to see peace in the world. So, let’s do something different this year. Accept the mundane. Sit with sadness. Go outside even though it’s cold. Look the cashier in the eye and smile – for real. Notice the flash of a bird’s wings in flight – and notice how it sounds flying overhead. Put the television in the basement closet. 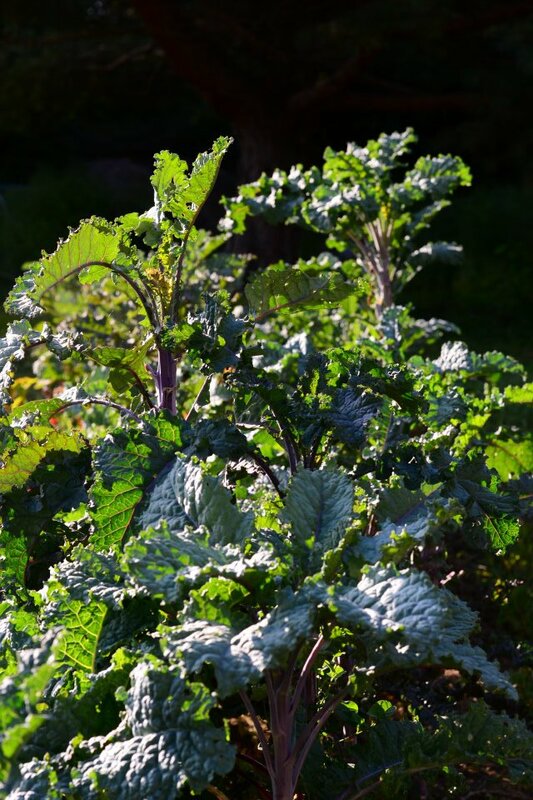 Grow some kale.